There are a lot of things to consider when it comes to having your dream website — Is it aesthetically pleasing? Easy to navigate? Reaching the right people? These are just a few basic questions you should be able to answer. But you need to look a little harder, because when it comes to your site, there are details you shouldn’t ignore. 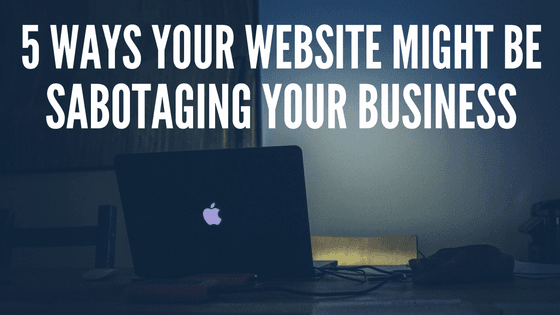 Here are five ways your website might be sabotaging your business (without you even knowing it). 1. Your site isn’t mobile-optimized. It isn’t news that we’re all addicted to our mobile devices, and that’s why it’s more important than ever for your site to be mobile-friendly. Mobile-optimized sites include text users can read without zooming, webpages that fit a mobile screen, and links that are easy to select — basically, a site that’s easy to use. And if your site isn’t mobile-optimized, people won’t want to waste their time on it. So optimize your site to create a better mobile experience and happy users. 2. Your site doesn’t prominently display your contact info. If you want visitors to your site to engage with you, you first need to tell them how to get in touch. That’s why your address and contact information should be easy for people to find on your site. And it’s not enough to only display it once on your contact page. Your address and contact info should be displayed prominently on every page of your site so it’s impossible to miss. 3. Your site lacks calls-to-action (CTAs). Call now, sign up, learn more — These are all examples of CTAs that help convert visitors to your site into customers. CTAs are instructions that motivate people to take action. And a website without these tools is missing out on opportunities to bring in leads and customers. If you want more info about creating CTAs that convert, we wrote a blog post about it. Check it out. 4. Your site has too much text. The text on your site is important, but no one wants to read paragraphs and paragraphs about your business — this bombards people with information, and on top of that, it doesn’t look good. So condense. Only include important information that’s easy to read so visitors aren’t overwhelmed. Remember to stick to telling visitors what they NEED to know. 5. You’re not investing in your site’s SEO. If you’re not thinking about search engine optimization (SEO), you should be. SEO focuses on driving traffic to your site through organic search results and is essential if you don’t want your site to be buried in results. There are lots of opinions out there on what practices are best for SEO, but it all comes down to one thing: Search engine algorithms are designed to bring users the best results. So make sure your site is one people want to see, i.e., user-friendly, keyword-rich, mobile-optimized, and full of high-quality content. It’s not easy creating the perfect site, but we’ve figured out all the details so you don’t have to. Call 844-207-9038 or email hello@mopro.com to learn how we can build you a site that does your business justice.